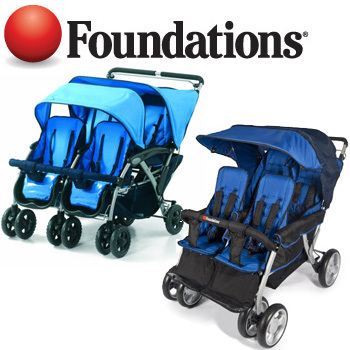 Foundations makes a Quad 4-Passenger Stroller. They have two models – the Sport (older model) and LX4 (newer model). Those two models very similar in terms of features. We will focus in our review on the LX4 model (There isn’t significant difference between the older model and the LX – The braking system is a little better and there’s a general feel that the LX is a little more comfortable and can handle more wear-and-tear). 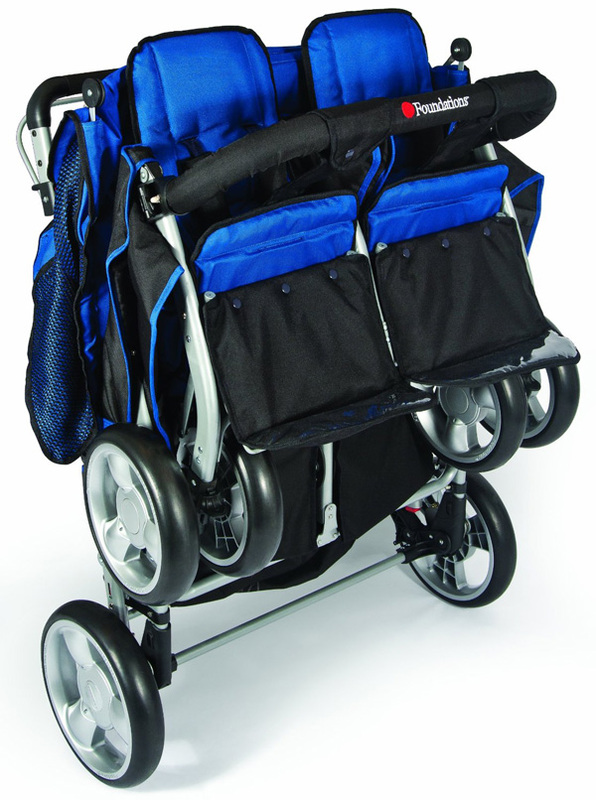 Foundations’ Quad LX 4-Passenger Stroller is a good stroller for seating three or four children. It has a hand brake that is very effective but some find to be too strong for what they need. It’s a somewhat bulky stroller, so you might not fit perfectly in every store but it’ll make it through most doors and it will take a beating. Owners who have had this stroller and the triplet strollers from Foundations have said that this stroller is much stronger and doesn’t have any of the same fraying and wearing issues. If you’ve got the size, this is a strong stroller. Foundations’ Quad LX 4-Passenger Stroller is a very sturdy and useful stroller that’s a little awkward because of its size and weight. It’s earned the nickname “The SUV of Strollers” and that’s a pretty apt description. 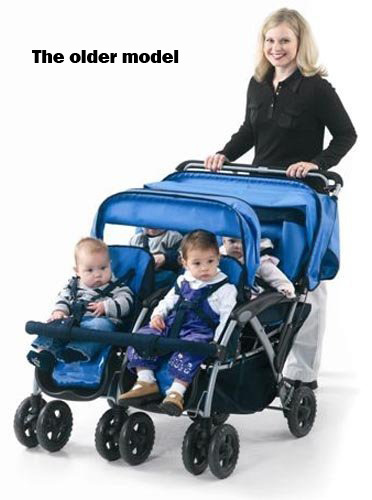 It’s a very roomy stroller for everyone and it’s easy to push once you get things going. The steering is well-made and customers say that they’ve had no issues with tipping or turning even if the weight wasn’t distributed evenly. The seats offer reclining options and these seem to be a big hit with kids. 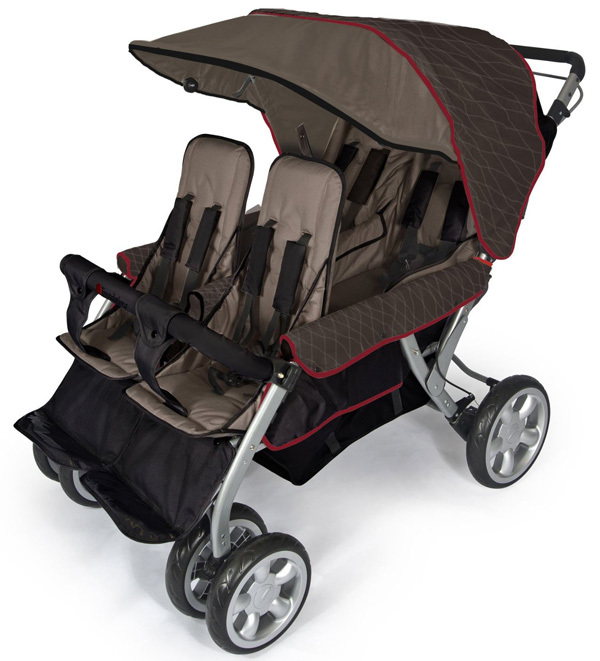 Lots of reviewers say kids cozy up to the stroller and have enough room to nap with ease. 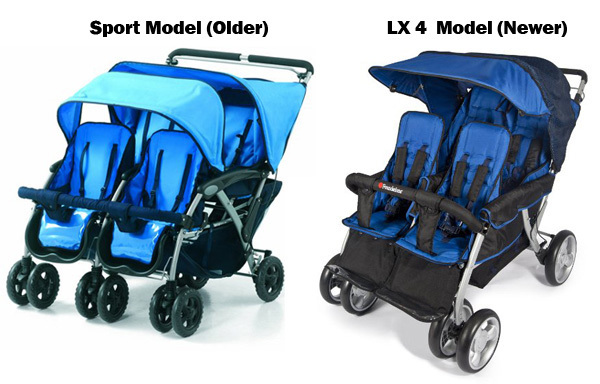 Unlike some of the other models, the Quad LX 4-Passenger Stroller has stood up to punishment and isn’t prone to fraying. Your four sit in two rows of two, all facing forward with a single canopy guarding everyone. This can mean that some in the back get a little less of a view but it makes up for that with a slim profile. This stroller will move through just about any door you come across. It also fits in the back of most trucks and mini vans, though smaller cars will have some trouble fitting it – that goes pretty much for all four seaters. One of the biggest gripes is that there’s some assembly required and people have had issue installing the runaway brake line. It has caused problems for a few users, but Foundations provides support and a couple sets of directions so you should be able to put it together just fine, but expect it to take a little while. The weight and height of the stroller contribute to its main problems: it’s hard to see around for many and it’s too heavy for some to lift into their car. Its heft can also make it hard to fold up, though this will get easier over time. The retention straps use a double-D-ring design that is really hard to use. 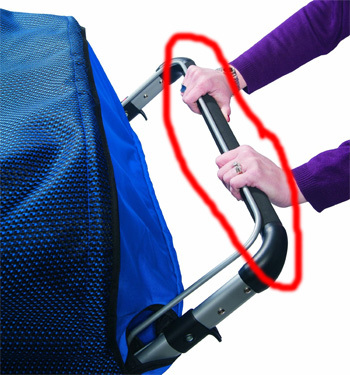 Unfortunately, it’s hard to fold the stroller up tight enough so that you can ease up the straps; so many customers just forgo using these. There are a few other issues with secondary parts, like the front bar being able to be kicked off by feisty kids or the large storage space having something of a limited access when the stroller is loaded with kids. There are few accessories made by Foundations itself for any of its strollers, and this line seems to have no specific accessory. 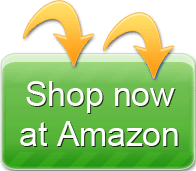 Many users report that they needed to purchase their own storage for wallets, cups and small things. Lots of people also purchased mesh bags and other packs because they needed more storage space to access things while they’re pushing the stroller. 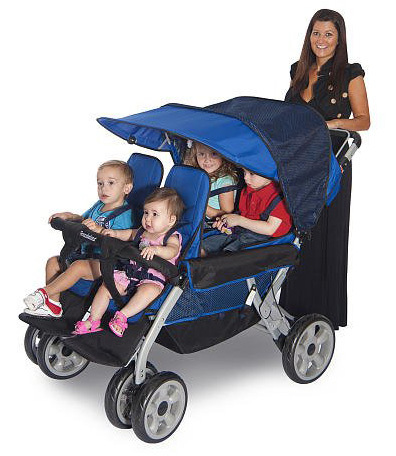 If you’ve got three/four kids and some muscles this can be a great stroller for you. Users and their kids seem to really like the design and the stability it provides. It makes sense for you if you don’t want to use the brake lever because most users zip tie or otherwise wrap up the handle so the safety brake system is never engaged. This will fit through just about any door you meet, so it’s great for all of your daily errands. It can be a little heavy, so you’ll want to make sure you’ve got a big enough car to accommodate its specs above. 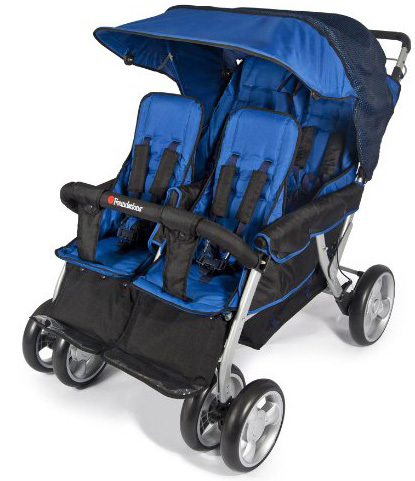 It’s a great stroller for keeping everyone and all of their goodies together. You’ll have some peace of mind knowing that all are safe and contained in crowded places. 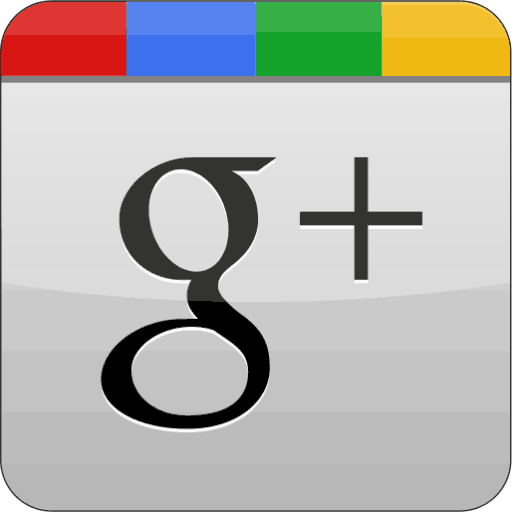 At under $500 – usually close to $400 or $350 – price is also not a big factor. This is a great piece for most families with three/four kids. Yes. Shades may be somewhat difficult to remove but they can be removed for storage or walking around. This model seems to have a sensitive brake but it does not suffer from the damage and loss of braking common in other Foundations models. Nothing significant. The braking system is a little better and there’s a general feel that the LX is a little more comfortable and can handle more wear-and-tear. Foundations is mostly a crib maker and produces products for hotels and homes. The company touts its services for major hotel chains and other high-use environments. This may not be the best stroller if you just have three kids, but it’s perfect if you have four or the fourth may be on the way (Note – if you have three kids, you might consider using the four seat for more storage). It’s also great for daycare providers who take kids on excursions. It’s a heavy stroller and you’ll need some muscles to get it into any high truck or van, but it’ll allow you to keep everyone and everything very well contained. If you’re looking for the versatility, endurance and space but want to cut costs, you can opt for the older model (lacks the LX branding) online and save about $100. I wish the wheels were better. Larger pneumatic would be perfect, four 20 lbs plus children become very heavy. Also the tires that are on it now are impossible to push through snow. 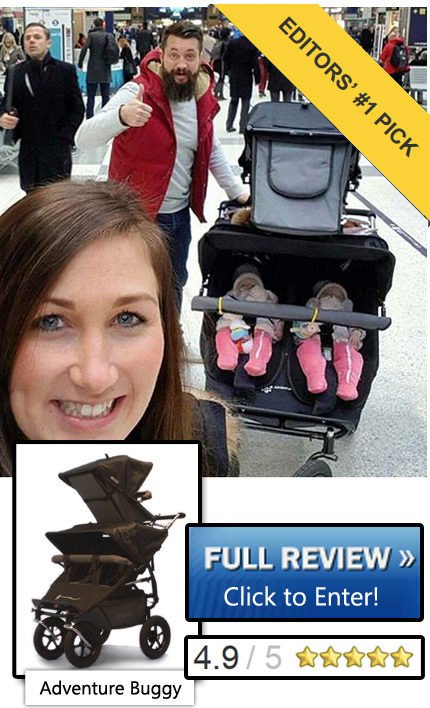 Over all its a very good stroller, but sadly I will not buy or recommend. Just way to difficult to manage.